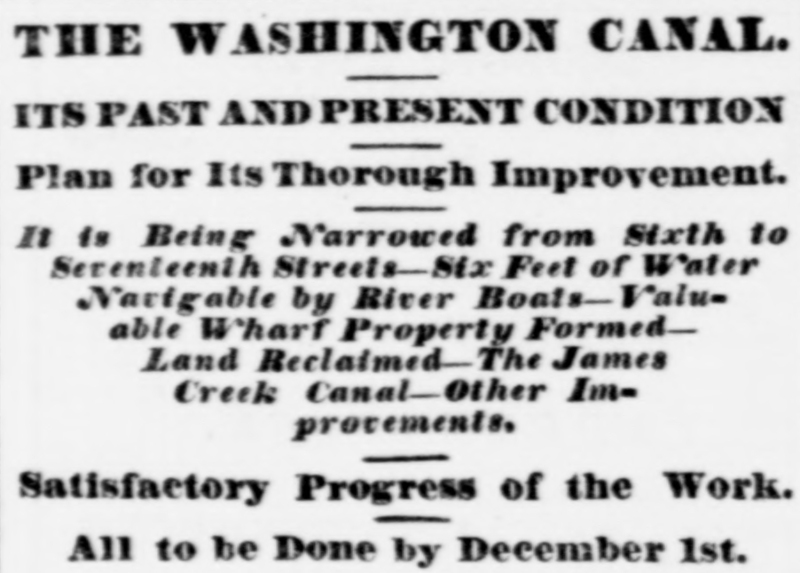 “Washington Canal filled in,” Histories of the National Mall, accessed April 22, 2019, http://mallhistory.org/items/show/201. By 1871, the Washington Canal was little more than an open sewer. Although many people proposed ways to make the canal functional, no solution was ever put into practice. In February 1871 Congress revoked the charters that made Washington and Georgetown independent cities and brought the entire District of Columbia under a territorial government. The Director of the Board of Public Works for this new territory, Alexander Shepherd, immediately enacted a solution to the canal problem by filling it in. The newly created road where the canal had been was first called B Street, then renamed Constitution Avenue in 1931. Evening Star (Washington, DC), August 9, 1871, via the Library of Congress. View original.